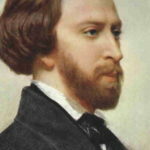 Alfred de Musset was a French dramatist, poet, and novelist. Along with his poetry, he is known for writing the autobiographical novel La Confession d’un enfant du siecle (The Confession of a Child of the Century). "There is no worse sorrow than remembering happiness in the day of sorrow."